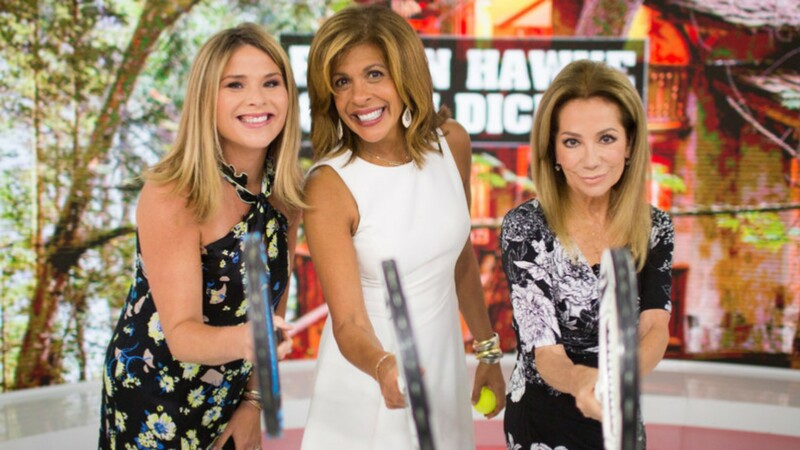 With Kathie Lee Gifford’s Today exit in April getting closer with each passing day, it’s only natural avid fans of hers as well as Today‘s have questions about what will happen next. Who will step in for Gifford? What’s the plan? Last week, rumored candidate Jenna Bush Hager commented on taking over for Gifford on Today, playing it cooler than cool in her statement to Entertainment Tonight during the Hudson River Park Friends Playground Committee’s Fourth Annual Luncheon in New York City. We’ll see, indeed. Hager has been a fill-in for Gifford in the past on Today in addition to being a seasoned correspondent on the morning show. It’s not entirely out of the question for her to be a top candidate for Gifford’s replacement, even if there’s been no concrete news about who could take over. Also at the event and on hand to keep it vague but thoroughly intriguing was Hoda Kotb, Gifford’s current cohost and the future cohost with Gifford’s replacement. Since announcing her Today departure in December 2018, it’s been full steam ahead for Gifford as she continues her cohosting gig with Kotb and no mention of plans post-Today. Between the business-as-usual attitude from Gifford and not so much as an inkling of who could actually take over for her come April, we are very curious to see who the NBC bigwigs go with. Considering Hager’s chops and the fact that she’s practically a Today fixture, we’re gonna bet big on her.